Sen. Chuck Grassley (R-Iowa) drew widespread attention on Twitter Monday afternoon when he made a mysterious proclamation about a Dairy Queen franchise in Iowa. Grassley’s officeSen. 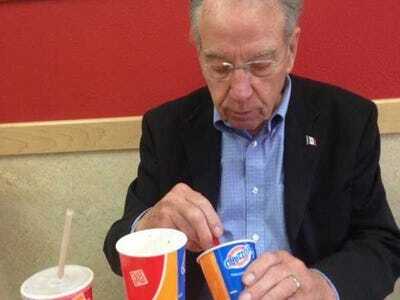 Chuck Grassley (R-Iowa) enjoying his Dairy Queen. Grassley’s tweet instantly led to many jokes including some suggesting he was discussing doing something inappropriate at Dairy Queen. However, Grassley’s spokeswoman told Business Insider the senator was most likely referring to eating the company’s blended “Blizzard” sundaes. “I presume he means ice cream or maybe more specifically, a Blizzard,” she said, attaching a photo of the Grassley enjoying some Dairy Queen ice cream.